Tanzania & Extractives – another Twist ? Agricultural Marketing – Make or Break ? For a week in November, the attention of Tanzania’s political scene was diverted away from the constitution and the 2015 elections and onto yet another energy sector corruption scandal – the IPTL Escrow case. The long-awaited report of the Controller and Auditor General (CAG) into the case was presented to the Parliamentary Accounts Committee (PAC) which in turn reported the key findings back to parliament. That the report was presented at all was a triumph for parliamentary procedure and for a few determined MPs, including the Speaker, Anna Makinda, who resisted reported attempts by the judiciary, the Prime Minister and others to block the debate. The scandal saw more than £116m taken from an escrow account at the Bank of Tanzania and transferred to offshore accounts held by private businessmen and government officials, according to Zitto Kabwe, the firebrand opposition (Chadema) MP and PAC chair. 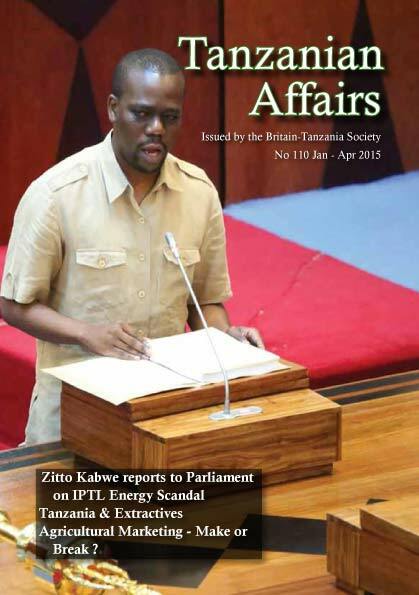 Kabwe presented the report to parliament together with the PAC deputy chair, Deo Filikunjombe (CCM). The escrow account was opened in 2006, following a disagreement over charges to be paid by Tanesco, the national energy utility, to IPTL for emergency power generation. Tanesco was to deposit money in the account until such a time as the disagreement over charges could be resolved. The ownership of IPTL has since changed hands, and a Tanzania-born Kenyan businessman, Harbinder Singh Sethi, now claims to be the legitimate owner of the firm, and that the funds in the escrow account were rightly his. The case hinges principally on two issues: who is the rightful owner of IPTL, and did any or all of the money in the escrow account belong to the government and/or Tanesco? The Parliamentary Accounts Committee said that irregularities in the sale of IPTL to Sethi’s company, Pan-African Power Solution (PAP) meant he was not the proper owner of the firm. Citing the support of the Controller and Auditor General, the Director General of the Prevention and Combatting of Corruption Bureau (PCCB) and the Commissioner of the Tanzania Revenue Authority (TRA), the committee argued that most of (or all) the funds in the escrow account were the rightful property of Tanesco. Attorney General Frederick Werema, Minister of Energy and Minerals Professor Sospeter Muhongo, Prime Minister Mizengo Pinda and later President Kikwete all disagreed, arguing that Sethi was the owner of IPTL, and that the escrow account funds were his. The case has already brought a heavy financial toll to Tanzania. In addi­tion to the money allegedly stolen from the public purse, the UK and eleven other international donors have suspended $490m in general budget support for the current financial year, citing the slow pace of investigations into the case. More recently, the Millennium Challenge Corporation, a US aid agency, indicated that they were monitoring developments closely and warned that their decision on a new fund­ing agreement – potentially several hundred million dollars – would depend on the Tanzanian government acting swiftly and decisively to combat corruption. In presenting his committee’s report, Kabwe drew both shock and laughter as he explained that the Director General of PCCB had confirmed that people had collected funds in cash from the Mkombozi and Stanbic bank branches in plastic carrier bags, cardboard boxes, and sisal gunny sacks. As much as Tshs 73.5bn ($45m) was reportedly withdrawn on a single day in January 2014. In his response to the parliamentary debate and resolutions, delayed by his health condition, President Kikwete spared the Minster of Energy and Minerals, Prof Muhongo, though parliament had called for his sacking. Instead, the President said that he has formed a team to investigate the Minister, and will make a decision once the team has reported back to him. Prime Minister Pinda also survived when parliament revised the initial recommendation of the PAC that he should step aside. In December the scandal claimed two senior scalps. Attorney General Werema, resigned on 17 December, though he denied any wrongdoing and said he was stepping down because his legal advice had been misunderstood. A few days later, President Kikwete sacked the Minster of Lands, Housing and Human Development Anna Tibaijuka for accepting a $1m payment from a Tanzanian businessman James Rugemalira, linked to the case. Rugemalira had sold his 30% stake in IPTL to Sethi for $75m, and is alleged to have then transferred significant money into accounts held by a long list of public figures, including $1m to Mrs Tibaijuka. She does not deny receiving this amount, but claims that she was merely channelling the money onwards to a school. Other reported beneficiaries of Rugemalira’s generosity were senior political figures such as former Attorney General and veteran of the BAE-radar scandal, Andrew Chenge, two former Ministers of Energy and Minerals, William Ngeleja and Daniel Yona, and board members and employees of Tanesco, the Tanzania Revenue Authority, the Tanzania Investment Centre (TIC) and the Registration, Insolvency and Trusteeship Agency (RITA), as well as two judges and two bishops. The political impact of the scandal, particularly in terms of the forthcoming elections may be significant. Pinda, a leading candidate for the CCM presidential nomination, has been weakened in the public eye. Anna Tibaijuka is no longer a viable candidate. The Speaker, Anna Makinda, an outside possibility for the nomination, surprised many with her strong handling of the affair – standing up to powerful figures, protecting parliamentary independence, and chairing heated discussions with considerable dexterity. Other leading potential CCM candidates for the presidency did their best to stay out of the fray. Edward Lowassa and Bernard Membe were notably quiet, in public at least, and January Makamba spoke only in general terms that corruption should not be tolerated. Though Chadema (aside from their renegade member, Zitto Kabwe,) was late to exploit the case, the party is likely to pick up some votes from the affair, simply because it makes CCM look bad. Beyond the presidential race, several MPs’ reputations were enhanced. David Kafulila (NCCR-Mageuzi) earned plaudits for his long-standing campaign to bring this case to public attention. Zitto Kabwe’s forensic skill and determined handling of the PAC has been noted, and there are signs of a possible thawing of his previously frosty relations with his Chadema party leaders. Deputy PAC chair Deo Filikunjombe (CCM), was visibly nervous in presenting the report, and spoke later of his discomfort in calling for the resignation of a Prime Minister who was seated just a few feet away. Though his public reputation has been enhanced, he has lost popularity with some senior party figures, and may therefore face a difficult re-selection process in his Ludewa constituency. Anti-corruption investigators continue to look into the case, and promise prosecutions where appropriate. Despite the pressure being exerted by donors, this may or may not happen. Though two senior government figures have lost their jobs, the suspicion remains that many others – including senior figures within State House – have got off lightly. In November the Executive Director of Tanzania Legal and Human Rights Centre Dr Hellen Kijo-Bisimba said President Kikwete failed to take a bold decision on the scandal and in turn acted “like an advocate of Pan African Power Solution.” Even Zitto Kabwe showed little appetite to take the matter further. “As Parliament we passed the resolutions by consensus, patriotism and avoiding being unfair to anyone. 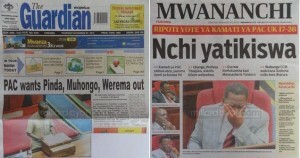 Parliament did its work ….and I’m leaving this matter to wananchi, they will make their own judgement,” he said. The leader of opposition and chairperson of Chadema Mr Freeman Mbowe said by failing to sack the architects of the scandal the President showed the country that he is part of the wider corruption problem. “Anna Tibaijuka was but a branch of the scandal, so she was used as a scapegoat, while [those who] orchestrated the whole thing are yet to be touched,” he said. A political science professor from Ruaha University College, Gaudence Mpangala, said the President did not arrive at decisions that were awaited by many in the country. “By saying that the escrow monies belong to IPTL, the President blew the whole thing away and that is very wrong,” he said. TANZANIA & EXTRACTIVES ­- ANOTHER TWIST? In common with Ghana, Kenya, Mozambique, Sierra Leone and Uganda, Tanzania will soon enter the ranks of oil and gas producing countries. 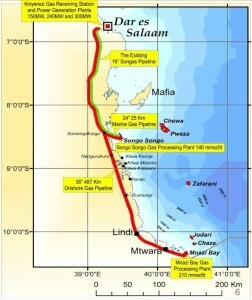 Tanzania’s discoveries are mainly off-shore in the Indian Ocean and dominated by gas rather than oil. These discoveries are large, and have excited expectations of greatly improved economic growth and incomes and of a windfall for the Tanzanian budget. The government recognises the need to manage expectations about what all this may mean. The resurgence of gold and diamond production after 1999 was associ­ated with the first real signs of structural change in the economy since independence. 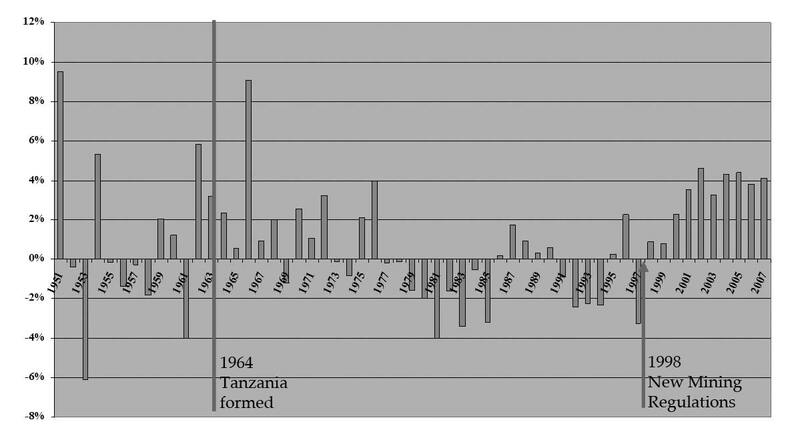 Specifically, the turn of the millennium saw the longest sustained period of per capita income growth (1999-2014) since 1950 (fig.1), Tanzania as one of the top non-oil countries in Africa in terms of the volumes of foreign direct investment (FDI), the rapid rise of gold exports which quickly overtook traditional agriculture exports as a source of foreign exchange earnings (fig. 2), and a significant increase in government revenues from mining to $385 million (7% of all tax revenues) by 2012. There is considerable controversy in Tanzania over many aspects of mining, as the windfall associated with gold and diamonds has not been managed in a way that might have yielded optimum benefits both to the nation and to the affected communities around Mwanza and Shinyanga. But the mining boom has certainly given the authorities significant experience of the issues associated with managing natural resources wealth. How will the new gas finds change the situation? The gas discoveries so far are on a scale far larger than anything ever seen in gold and diamond mining. Early estimates from just one of the 20 or more major companies currently licensed to explore for oil and gas, suggests that FDI from their project alone could top $5 billion in the peak year of construction some 5-6 years from now. This is some five times larger than the maximum annual FDI seen in the years of the gold resurgence. In the short term (to end-2016) there seems certain to be some significant gains in Tanzania’s capability for electric power generation fuelled by the early stage on-shore gas at Mnazi Bay for which much of the com­mercial contracting has already been finalised. In the longer term (after 2021) there are expectations of large gas exports in the form of liquefied natural gas (LNG), with a variety of domestic uses in addition to electric power generation. In the past three months Wentworth Resources of Canada, working with Maurel and Prom (a large French com­pany – the operator) and the state-owned Tanzania Petroleum Development Corporation (TPDC), have signed a gas sales agreement (GSA) with the government. This provides for the deliv­ery of up to 80 mil­lion cubic feet per day (mmscf/d) to the new Chinese-built Mnazi Bay pipeline to Dar beginning in 2015. 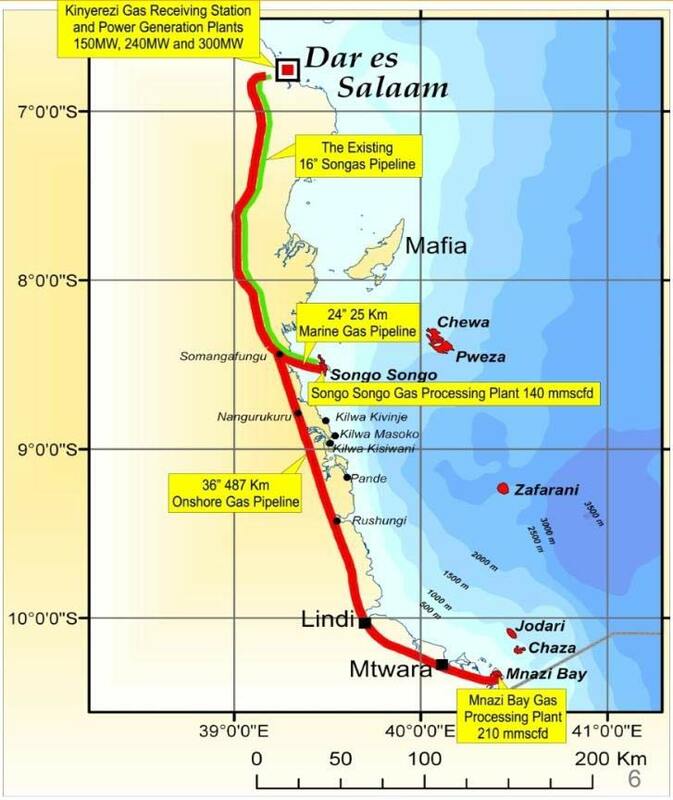 This pipeline is much longer than the existing pipe­line from Songa Songa which currently delivers the bulk of Tanzania’s existing gas production (fig 3). By 2016 the Wentworth GSA provides for the delivery of up to 130mmscf/d to the new pipeline. This development is highly significant. First, it will help to justify and partially cover the $1.2 billion costs of the new pipeline, which will have a large capacity (around 750mmscf/d). Second, the GSA involves a gas selling price at Mtwara of $3 per million cubic feet (mcf), allowing TPDC to sell that gas to Tanesco in Dar at around $5. This should allow Tanesco to generate power at nearer 12 cents/kilowatt hour rather than current cost of around 35 cents using diesel, jet fuel etc. With Tanesco currently selling power at around 16 cents/kwh, the huge government subsidy to Tanesco (estimated at TSh 353 billion in 2013/14) should be significantly reduced. The new gas will also more than double the volumes of gas currently available for power generation which could contribute significantly to attaining the Tanzanian “Big Results” target of 5 million more people with access to electricity. The new gas situation will also create new jobs and higher income for some local populations, new investment opportunities such as the integrated cement plant in Mtwara (to supply gas companies), and a welcome albeit small boost to government revenues. In the longer term the scale of the known and likely discoveries will be focused much more on the export of gas – processed into LNG. The Production Sharing Agreements (PSAs) already signed with gov­ernment anticipate that at least 5% of total production will be provided to the domestic market, which means up to 95% will be exported. Even a 5% share of a huge volume of gas will provide many opportunities to expand domestic power generation and open up petro-chemical indus­tries such as fertiliser production. to China and other East Asian countries by about the fourth year of production (circa 2025 depending on when final decisions are taken). Tanzania’s total exports in 2012/13 were $5.5 billion. equivalent to just under 3% of GDP – moving towards $2 billion per annum. This compares with Tanzania’s present total grant receipts from aid donors of around 3.3% of GDP and a budget deficit of 5%. 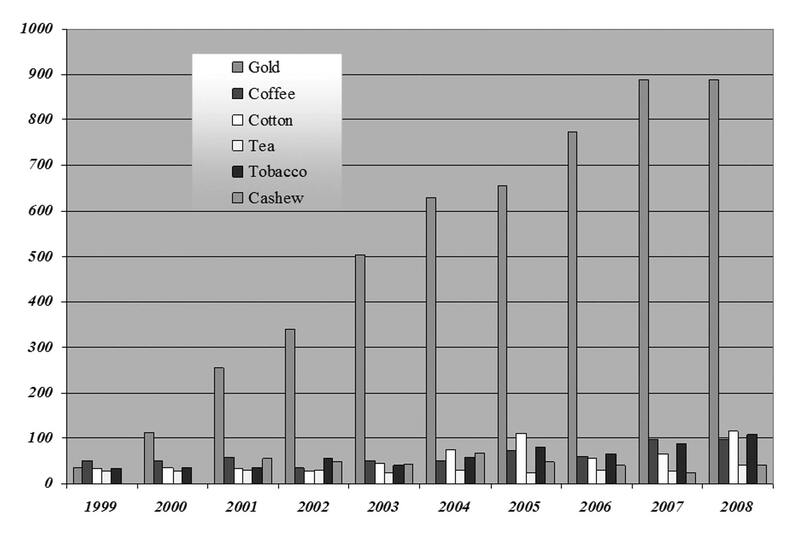 It is several times more than the revenues currently received from gold and diamond mining. construction, falling to several hundred new jobs in the years of regular production. These potentially transformational orders of magnitudes are based on the likely outputs from only three concession blocks. At least another eight concession blocks in the Indian Ocean have exploration underway – Statoil of Norway, Ophir, Shell and Petrobras of Brazil (see TA 102 for a map of the concessions, and article below by Roger Nellist for information on latest discoveries). Exploitation of Tanzania’s natural gas presents a wide range of possible threats as well as substantial new opportunities. Several areas of policy need to be very well-managed over the next few years if the Tanzanian people are to obtain a real benefit. The government is well aware of the main issues and its Natural Gas Policy presented in 2013 contains ideas on most of these. There are still numerous difficult technical problems to solve in extracting gas from the Indian Ocean under 1,400 metres of water and a further 2,000 metres of variable sea bed strata. There is no guarantee that the concessionaires will be able to solve these problems at an acceptable cost. There is still a question mark over whether the companies will be able justify the huge upstream and mid-stream investments that are required given the (changing) expectations of the global market e.g. the recent large falls in oil prices. One concessionaire alone is anticipating a full investment cost of well over $20 billion. Can the government and TPDC finance the large infrastructure and investments needed to ensure the delivery and effective usage of the available gas? Who will coordinate the efforts of the different govern­mental players and prospective investors? Will the global demand and supply situation remain favourable to exploiting the Tanzanian resources over the very long period (circa 30 years of more) anticipated by the off-shore projects? A communications strategy is needed immediately to manage expec­tations in government, in the affected local communities and in the country more generally. The 2013 Gas Policy refers directly to this matter, but the government is handicapped by the fog of ignorance (and rumours) about the true magnitudes and timing of benefits. Much will need to be done to develop skills in both the private and public sectors. Although few direct jobs will be created there are large opportunities for indirect job creation through linkages to the rest of the economy. The problem is that most of the jobs become in the construction phase. To be filled by Tanzanian workers, a large skills training programme needs to start very early – as indeed it has but on a relatively small scale. Tanzania now has some effective and well qualified civil servants and specialists. But the depth of the skill base is often thin, for example in the areas of contract negotiation, regulation of the sector, contract man­agement, and management of the fiscal regime. Attention needs to be given to the strengthening of a National Oil and Gas Company (NOC) based on the present TPDC – building its financing, its specific roles, its capacities. The division of roles between government and the NOC has been a source of much difficulty in other countries. The government needs to exercise caution on the macroeconomic fundamentals to avoid exchange rate appreciation and damage to tradi­tional export activities – the Dutch Disease problem. 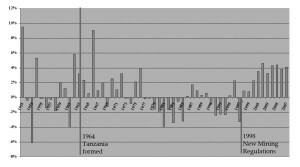 Should Tanzania establish a Sovereign Wealth Fund? What stabiliza­tion arrangements, if any, should be set up to guard against the future volatility of oil and gas prices and to ensure that other sectors are not left behind? The emphasis must lie in building human capacity in all sectors with transferable skills from oil and gas. Tanzania is fortunate to discover gas now. They can learn lessons from other countries on the importance of transparency and good governance. Above all, how to protect this unique opportunity from political opportunism and mismanagement, especially with an election in 2015. On 8 November, Tanzanian President Kikwete underwent a successful operation to remove a cancerous prostate. The operation was conducted at the Johns Hopkins Hospital in Baltimore, USA. The President remained in the US for three weeks for recuperation before returning to Tanzania. President Kikwete thanked all Tanzanians for praying for him and commended the media for conveying the right message away from distortion. “In September, last year, I went for a medical check-up and doctors diagnosed me with prostate cancer. They told me that since it was still at a manageable level, an operation could remove it completely and stop it from spreading to other parts of the body. Before going for the operation, I wanted to ‘put the house in order’”, he added, explaining that he had been waiting for the Constituent Assembly to complete preparation of the proposed new Constitution. “Although I looked normal and continued with my duties, the illness remained a source of ‘inward misery.’ It took eight months to inform my wife but she is great and encouraged me to undergo treatment. I am glad am cancer free. Doctors said that after such an operation a patient could survive for 30 years depending on one’s age,” he said. President Kikwete explained that since the 1990s when he served as the minister for energy and minerals, he cultivated the culture of undergoing regular medical check-up. He appealed to ‘wananchi’ to emulate that way of life. 1.If there is no market for a crop, don’t grow more than you can store and eat. 2.If you are trying to promote expansion of an agricultural product, then you will fail if the marketing arrangements do not work. Farms – large or small – are businesses. Farmers make choices, about what crops to plant, how much of each, when to plant them, where, when to weed and how often, whether to use inputs such as fertilizers and insecticides, and so on. Small farmers need money – for school uniforms and school fees, agri­cultural tools, food items that they cannot produce themselves, medical costs, clothes and shoes, cooking utensils – and if at all possible, cement and wood for houses, bicycles, mobile phones, lamps, bus fares, and all that we can imagine that makes a better life. They are therefore integrated into national, and indeed international, economies. It is misleading to call them peasants, or to imply that they can be entirely self-sufficient. They cannot exist if they are paid very little, paid late, or not paid at all. Large farms are also businesses, and face many of the same risks as small farmers: failures of the rains, attacks by insects, birds or animals, plant diseases, and unexpectedly low prices. Until the 1970s many farmers were organised in cooperatives, which purchased their crops and took responsibility for repaying credit. Much of what was produced was sold by marketing boards. But by the time of liberalisation in the 1990s most of these arrangements had broken down and agricultural marketing was left almost entirely to the private sector. The result has been a series of disasters so bad that farmers only continue growing crops when they have no other plausible alternative. For cotton, businessmen purchased ginneries and employed buyers to purchase the crop from the farmers. Farmers had a choice of where to sell. If one buyer rejected their cotton because of poor quality they could sell to another. If they took credit from one buyer, they could sell their cotton to another and avoid paying back the credit. Buyers travelled over large areas to buy cotton – and one consequence was that the varieties which had been specially bred for the North and the South of the cotton area got mixed up. The position now is that many farm­ers are adulterating their cotton with sand, water, or even hygroscopic chemicals – and Tanzanian cotton sells at a discount on world markets when once it sold at a premium. To get back to a position where qual­ity could be achieved, the government promoted “contract farming”, where farmers contract with a single buyer who also supplies credit for inputs; in the central cotton areas this was opposed and ultimately sabotaged by small ginners who did not have access to the capital to provide credit to farmers. The position with coffee is much the same. A sharp decline in quality, a failure to manage credit, and low prices. 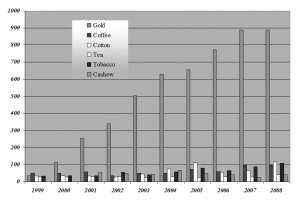 Cashew nut farmers produced a bumper crop in 2011/12. The local pro­cessing factories were swamped. The buyers had insufficient money to buy it all in the short window when Tanzanian cashew nuts can be sold to India, before the Indian crop is harvested. So they paid for the cashew nuts with IOUs. Many of those farmers are still waiting to be paid. Rice production has been one of the success stories. But just when farmers were doing well, the Bank of Tanzania approved imports of cheap rice which depressed the prices, and many farmers who have taken credit to buy fertilizers or sprays could not pay back their loans. Maize is another success story, with record harvests in the Southern Highlands, Songea and Sumbawanga. According to the Citizen on 1 December, the surplus is more than 2 million tonnes, although the National Food Reserve Agency will only purchase 200,000 tonnes. There are good harvests in Malawi, Zambia and parts of Congo, so no easy export markets. Many farmers may not get paid. Some will try and store their maize, but without modern stores much of it will succumb to post-harvest insects, especially the large grain borer or Skanya bora, unofficially named after the lorries which transported food aid in the early 1980s. One of the main planks of “Big Results Now”, the most recent govern­ment planning strategy, is the “Warehouse Receipt Schemes” where a farmer takes the crop to a store and, provided the crop is of good quality, he or she can be paid in cash or in credit. If the latter, and crop prices rise later in the season, what they have sold will be given the higher value – and payment to the farmers may be made either in cash or in the form of seeds or fertilizers for next years’ crops. This is fine in principle, not so easy in practice, where corruption can creep in. The system fails altogether if the warehouses are full or the manager does not have sufficient cash. There are also problems with the marketing of sugar, where unexpected and perhaps corrupt imports have discouraged new local projects to increase production. Tanzania should be celebrating its small farmers (who have shown that they can produce surpluses of cashew nuts, maize and rice), not making them angry by not buying what they have produced. Crop marketing is a specialist skill. It is much more than an admin­istrative task. One consequence of liberalisation has been the loss of the expertise and contacts learnt in the days of the marketing boards. Since most crops are sold without the crops themselves being visible, it requires good contacts and above all trust, which can only be built up between individuals, and over time. Moreover, to achieve good quality, the marketing must be regulated: buyers who accept low quality must be driven out of the market, along with buyers who buy from farmers who have contracted to sell to someone else. The banks must know the reliable buyers, and lend them sufficient money to purchase the crops. Farmers unable to sell their crops on time and for fair prices cannot be blamed if they choose not to grow those crops in the future. During eleven days in August 2014, 3 brutal attacks, and 2 attempted attacks, were directed against persons with albinism, also known as “albinos.” The attacks result from societal stigma and the belief that the body parts of persons with albinism can bring good fortune when used by witch doctors to create good luck potions. This rampage of brutality has left the country’s population of people with albinism in a state of immobilizing fear. Since 2006 there have been at least 151 murders and attacks on persons with albinism in Tanzania. It is believed that most attacks go unreported. On 5 August a 15 year old girl was brutally attacked at her home in Tabora Region as she ate dinner with her family. The assailants hacked off her right arm just below the elbow. The men disappeared into the darkness with her arm. The girl lost a lot of blood and was semi­conscious when brought to hospital. Police have arrested three men in connection with the attack, including a neighbour who is a known witchdoctor. Eye witnesses who have spoken to police have since received death threats. “I am asking the police to move me to a safer place and protect me because bad men might come back to kill me” the girl said later. According to advocacy group Under the Same Sun (UTSS), a witch doctor had received an order from a wealthy client indicating a price of $600 USD. On the same day as this attack, the girl’s uncle, who also has albinism, narrowly escaped an attempt on his life as he walked to his father’s village. He was chased by two men holding machetes. He said he heard the men shouting, “Let’s cut him! Let’s cut him now!” When interviewed, he indicated that they were the same gang that had attacked his niece. He ran as fast as he could and fortunately escaped. A week later, on 14 August, a young man with albinism was found dead in Kinyerezi on the outskirts of Dar es Salaam. His mutilated body had been dumped in a swamp. Sections of skin on his upper torso had been removed. The skin of persons with albinism is in high demand for witchcraft rituals. On 16 August a 35 year old mother of seven children was brutally attacked at her home in the Igunga District in Tabora Region. Two attackers cut off her left arm before fleeing. Her husband was beaten to death while defending his wife and two of their children sustained injuries. One suspect has been arrested. The Constitutional Assembly (CA) was disbanded in October 2014 after delivering the final draft of the proposed Constitution to the President, who has invited the public to endorse the document in a referendum to be held in April 2015. Despite the heated disputes which have taken place among the political factions within the CA, the government announced that the required two-thirds majority for approval of the draft by the CA had been met. However, many members of the opposition have disputed this. A CA member from Zanzibar, Haji Ambar Khamis, claimed that even though his name was listed as approving the draft, he had not done so, and he reportedly collapsed whilst explaining himself. Four opposition parties (Chama Cha Demokrasia na Maendeleo (CHADEMA), the Civic United Front, the National League for Democracy and the National Convention for Construction and Reform) have decided to join forces against the government and mount a joint challenge to the draft constitution on the grounds that the government failed to follow the legal procedures during the vote in parliament. There is still some debate as to whether the new constitution can be considered a success even if it survives this possible legal challenge and is adopted after the referendum. Those in one camp will say that this draft improves upon the current constitution by addressing the needs of all Tanzanians by including the nation’s children, women, the disabled and other minority groups. Changes to the constitution have been warmly welcomed by Tanzania’s Gender Coalition Group who have stated that approximately 90% of their proposals for reform to women’s rights have been adopted by the CA. One of the proposals which has received praise is for women to have equal land ownership rights which “gives every woman the right to obtain, own, use, develop and manage land under the same rules which are applicable to men”; the ability to confer citizenship to their children; better employment rights; and more advantageous representation in parliament. The draft also seeks to redress the issue of exploitation of children by clarifying the definition of child as being a person under 18 years of age, which is relevant in combating child marriages. It also guarantees a right to primary education to every Tanzanian child. Minority ethnic groups, such as the Hadzabe and Akiye, are given further protection by the draft. However, the proposed constitution has removed notable sections from the previous draft, including new checks and balances on presidential power, and has watered down sections proposed by Warioba’s Constitutional Review Commission (CRC). In particular, the proposal to establish a three-government structure – Zanzibar, Mainland, Union – is replaced with a two government structure that closely resembles the current system. Whilst there was an attempt to include a provision for dual nationality in the final draft, unfortunately for many of the Tanzanian diaspora overseas, this was eventually omitted. Instead, by way of a compromise, a “special status” will be given to former Tanzanian citizens. Those of the “this-new-constitution-won’t-change-a-thing” camp argue that the whole lengthy process has been a monumental waste of time, money and ultimately, dominated by the government. CCM has been accused of bullying and “hi-jacking” the process. The drafting of a new constitution was supposed to be a civilised exercise in cross-party consultation, and all parties were supposed to set aside their differences for the greater good and for the benefit of generations of Tanzanians to come. This ideal was once again challenged on 2 November 2014, when a youth group of CCM supporters disrupted a meeting convened by the Mwalimu Nyerere Foundation to hear the Constitutional Review Commission (CRC) members, and in particular CRC chairman, retired Judge Warioba. An eagerly anticipated speech by a well-respected politician, quickly turned into an ugly scene more suited to a Hollywood action film. It was reported that “fists and chairs were flung into the air, camera equipment destroyed and journalists beaten up”. It now remains for the public to voice its opinion as to whether the Constitution should be adopted. For the new constitution to pass, majorities are needed in both parts of the union. CCM should have no trouble winning a majority on the mainland, but whether they can deliver the same on Zanzibar is more questionable. It is now only about four months to the parliamentary elections in Britain which are going to be hotly contested. It is about ten months before the presidential and parliamentary elections in Tanzania which will also be hotly contested. And, surprisingly, in neither country are political experts sure what the results will be. All this contributes to a growing political fever, even though political parties in both countries have increasing difficulty in persuading people to vote. The largest and longest serving party in Tanzania, the CCM, with its great strength, particularly in rural areas, is still fairly confident about remaining in power for another five years. Its popularity rests on its stability and its preservation of peace and order unlike most neighbour­ing countries. However, the unsatisfactory finalisation of the Constitution-making process (as explained by Enos Bukuku), the apparent government decision to ignore strong feelings in Zanzibar and say no to a third government, plus the increasing political tensions in parliament over demands for more transparency in the awarding of mining contracts (see Roger Nellist below) and the rising discontent about corruption (see Ben Taylor’s article on the ITPL scandal) must be causes of concern to many voters. The second largest party, CHADEMA, had great hopes of increasing its position substantially in the elections, but the attempts to expel their leading radical MP and anti-corruption campaigner, Zitto Kabwe, could have damaged its chances. CHADEMA’s leadership wants to get rid of Kabwe because of his reluctance to accept the party’s policies but Kabwe retains the powerful position of Chairman of the Public Accounts Committee of the National Assembly and thus remains of great interest to the media. He also attracts the support of many among the younger generation of potential voters. An opinion poll by Twaweza in November showed no clear front runner. Former CCM Prime Minister Edward Lowassa had the support of just one in eight voters, 13%; current CCM Prime Minister Mizengo Pinda, who announced his decision to stand in a BBC interview in London, had 12%; with 11% favouring the leading opposition candidate, Wilbroad Slaa from CHADEMA – a candidate for the presidency in 2010. But party loyalties remain strong. According to the poll, the ruling CCM party is supported by 47% of voters. Amongst the growing numbers of young voters under 35 years old, 44% claim CCM affiliation with 34% supporting CHADEMA. There are plenty of other CCM aspirants for the presidency, all except one of whom will be eliminated at CCM selection conferences early in 2015. They include Foreign Affairs minister Bernard Membe (with 5% support), East African Cooperation minister Samuel Sitta (4%) and Works minister John Maghafuli (3%) plus Defence minister Shamsi Nahodha. A rising star and one of the latest additions to the list of CCM presidential hopefuls is January Makamba, the Deputy Minister of Communications, Science and Technology and a CCM MP in Lushoto District. A close aide to President Kikwete for five years, at 40 years old he is much younger than most of the other aspirants. If the CCM candidate selection process results in a stalemate, a possible compromise might be Chief Justice Augustine Ramadhani, from Zanzibar who is a practising Anglican Christian and might attract a following in both Zanzibar and the mainland of Tanzania. The sagacious political commentator Elsie Eyakuze pointed out in The Citizen that in her view “by far the most interesting finding in the poll was that a full third of the respondents, when asked whom they would vote for, replied that they didn’t know”. She went on to say that “a significant portion of voters is willing to step away from Tanzania’s ‘strong-man formula of politics’ and consider alternatives such as better government!” She went on: “A grimmer interpretation could be that we have got ‘indecision paralysis’ because the options all look a bit unwelcome”. Eyakuze said that she hopes that the numbers of uncommitted voters will grow and grow. Unable to conceal her feminist views, she also pointed out that the most popular contenders in the elections “will all be men of a certain age. No one with a uterus or direct personal experience of the Twitterverse is going to get within sniffing distance of the office of President”. In a sensible move which will help the two smaller opposition parties to survive, a Memorandum of Understanding (MOU) has been signed between the two big opposition parties – CHADEMA on the mainland and CUF in Zanzibar and two small parties, NCCR-Mageuzi and the NLD, all of which have MPs in the National Assembly. Under the MOU the parties will field and support only one candidate (at all levels including the presidency) in the elections. This move should help in the survival of the two small parties and might even attract a few CCM candidates who are disappointed not to have been selected in the party’s candidate selection process. The referendum on the new constitution, according to present plans, will take place on 30 April 2015, six months before the presidential and parliamentary elections. It is difficult to forecast how this will affect the outcome of these elections. The Presidential Communication Directorate proposes to spend a large sum of money on the campaign for a “Yes” vote in the referendum and there will be a media blitz to persuade people to vote ‘Yes’. If they vote ‘No’ Tanzania could be in a constitutional crisis. Zanzibaris (one million people compared with some forty million on the mainland) tend to take elections very seriously and are likely to vote in large numbers in the constitutional referendum as well as in the elec­tions which will follow. But there have been rumblings of discontent about the way in which the constitution favoured by the CCM seems likely to be pushed through. Many Zanzibaris hoped that, if the alterna­tive three-party government had been accepted, Zanzibar would have a much greater influence in the future government of Tanzania. There is also the future of the Government of National Unity between Zanzibar’s two main parties CCM and CUF to be decided. The coalition government, installed in 2010 following years of political violence, has succeeded in maintaining political peace in the Isles for five years. This could prove to be popular with many voters especially in view of the political turmoil which many of Tanzania’s neighbours have suffered since independence. Tanzania intends to prepare the way for the use of new electronic voter registration technology, using Biometric voters’ kits. The Treasury has made funds available for pilot schemes in Kawe, Katavi and Kilombero constituencies but there has been some delay because the relevant people have not yet been trained. The National Election Commission intends to train personnel from 169 districts in readiness for the nation­wide registration exercise. Much of the news about the economy and business suggests fast-mov­ing new developments. Some of them, notably prospects for gas, are reported elsewhere in this journal. Nonetheless, the Tanzanian economy is still characterised as a basic agricultural one, where rural households continue to live in poverty. In a recent survey of opinions about the challenges they face, Tanzanians said that poverty, health and education remain the biggest challenges, with 63% reporting poverty to be the biggest challenge (up from 49% in 2012). 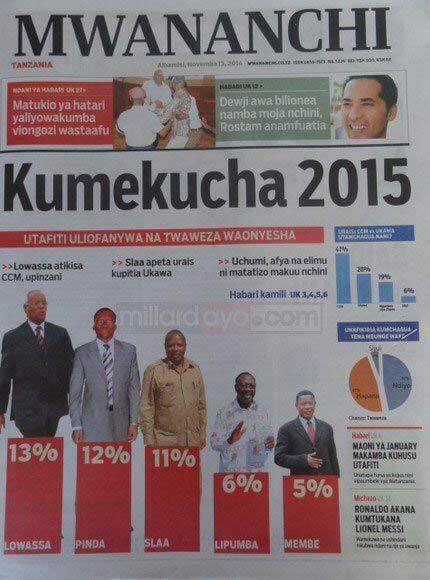 (Twaweza: “Tanzania towards 2015: Citizen Preferences,” Nov 2014). Income poverty has been reduced in all parts of the country, but particularly in Dar, and the difference in poverty rates between Dar compared with elsewhere is more dramatic than ever. While the reduction in rural income poverty is modest, living conditions and access to communication improved from 2007 to 2011/12. The percentage of households living in homes with a modern roof has risen from 55% to 68% and those with modern walls from 35% to 46%. GDP growth rates continue to be strong – 7% in 2013 and estimated by the IMF to be at this same rate in 2014. In October 2014 the annual inflation rate was 5.9%, a fall from 6.6% in September 2014. The NBS has revised the estimates of GDP, increasing the overall estimate of GDP in the base year of 2007 by 28%; and of agriculture GDP by 26%. The revisions result in estimated per capita GDP for 2007 at TSh 699,127 compared with the old estimate of TSh 547,081. Government revenue and expenditure for fiscal 2013/14 was below target and development expenditure will continue to be adversely affected by the withholding by aid donors of general budget support. Recurrent expenditure amounted to TSh 10,085.1 billion, or 91% of target, while development expenditure was 70% of estimate. The shortfall in development expenditure in 2013/14 was on account of lower disbursement of project funds and shortfall in external non-concessional borrowing. Improved telecommunications are expected to help farmers’ access to finance. At a conference in Arusha in November, Vice President Mohamed Gharib Bilal said that poverty cannot be seriously addressed without removing constraints on productivity, including financing of smallholder agriculture and agribusiness. Governor of the Bank of Tanzania Benno Ndulu, said over two-thirds of the working population derived its livelihood from agriculture. Limited access to finance was an impediment to farmers in adopting better technologies. Developments in communication technology are improving the situation; 57% of adults currently have access to formal financial services compared to barely 15% in 2009. A new study by the Economist Intelligence Unit confirms that Tanzania has the most conducive conditions in sub-Saharan Africa for expanding access to financial services for under-served populations. The use of mobile technology facilitates payment services, including those who have been under-served or unbanked, with the adoption of compre­hensive and conducive regulation of e-money and mobile payments. There are signs that Tanzania is changing its rather distant relationship with other members of the East African Union. During recent months it has allowed its citizens to move money across its borders. However, on environmental and natural resources management, Tanzania is holding back. It appears to have been doing its ‘homework’ more thoroughly than the other partner states. Before the signing of binding agreements on the use of Lake Victorian waters and other scarce water and pasture resources, Tanzania argued that a protocol on such issues, already ratified by Kenya and Uganda, contradicted the provisions on trading in minerals. Tanzania stressed that access to and the use of land and premises should be governed by national policies and laws and that the protocol included provisions on marketing and trading in minerals which should have been restricted to protection of the environment. Tanzania also noted that tourism should be removed from the protocols as it would be better covered under another accord now being negoti­ated. The EAC Secretariat was instructed to study the issues raised by Tanzania. The border between Tanzania and Burundi was originally demarcated in 1924 during the colonial period. But, over the years, some natural border references such as rivers have changed their courses or dried out. Sometimes officials have demarcated part of the border by just marking trees. Although the African Union has declared that states wanting to make changes should do so by 2017, the presidents of the two countries are reported to have met to reaffirm the border between their countries. The European Union has begun to step up its pressure on Tanzania to change its laws on human rights. The Head of the EU Delegation, Ambassador Filibert Sebregondi, has advised the Tanzanian govern­ment to increase the minimum age of marriage for girls from 15 to 18 years, eliminate polygamy and abolish the death penalty and corporal punishment in schools.